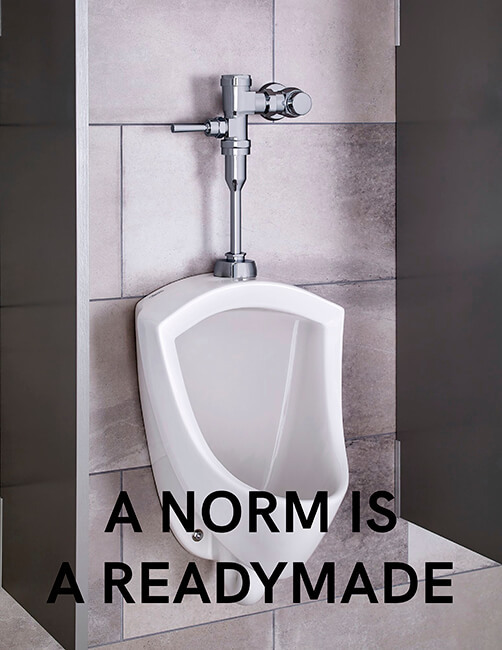 On the occasion of READYMADES BELONG TO EVERYONE, please join us for A Norm is a Readymade, featuring f-architecture, QSPACE, and Ilana Harris-Babou, and organized by Adjustments Agency. f-architecture collaborative is a three-woman architectural research enterprise aimed at disentangling the contemporary spatial politics and technological appearances of bodies, intimately and globally. QSPACE is a queer architecture research and design collaborative founded by Lauren Johnson and Ryan Day in 2016, shortly after graduation from the Masters of Architecture program at Columbia University Graduate School of Architecture, Planning, and Preservation (GSAPP). They define themselves as mixing Queer Theory, Social Justice, and Design Practice. QSPACE offers a platform for research projects by students and professionals working on queerness in the built environment. They are currently working on Coded Plumbing, a project investigating gender inclusive bathroom design, and The Queer Architecture Archive, an online archive of architecture and urban planning projects on queer topics in the built environment. Ilana Harris-Babou’s work is interdisciplinary, spanning sculpture and installation, but grounded in video. She has exhibited throughout the US and Europe, with solo exhibitions at The Museum of Arts & Design and Larrie in New York. Other venues include Abrons Art Center, the Jewish Museum, and SculptureCenter in New York, the De Young Museum in San Francisco, CPH:DOX* in Copenhagen, and Le Doc in Paris. She has been the recipient of the Fountainhead Fellowship at Virginia Commonwealth University, a Community Engagement Grant from the Rema Hort Man Foundation, a Van Lier Fellowship from the Museum of Arts & Design, and The Mary Hotchkiss Williams Travel Fellowship from the Yale University Art Gallery. She received an MFA from Columbia University in 2016, and a BA in Art from Yale University in 2013. Adjustments Agency is a studio founded in 2016 by Joanna Kloppenburg and Nicholas Korody. Their work investigates “the architecture of architecture” — the forces and structures that work to circumscribe the possibilities of architectural thought and practice — with the goal of redesigning it.